asap Super A+ Serum Review (2018): Is It Really Worth Buying? What is Asap Super A+ Serum? This product is brought to you by asap, an Australian skin care brand that is strongly committed “ to create simple skin care that has fast-acting visible results”. asap Super A+ Serum, US $65 for a 30 ml opaque bottle, is an anti-aging serum that goes beyond making your wrinkles and other signs of aging less noticeable. Asap Super A+ Serum — Does It Really Work? Deliver an all-encompassing anti-aging effect on skin. 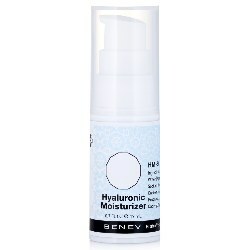 Intensively moisturize and condition your skin. Facilitate faster skin healing, rejuvenation and renewal. Boost your skin’s antioxidant levels and protection from cell damaging free radicals as well as UV, pollution, and other environmental factors that age and damage your skin. Enhance your skin’s surface texture as structure is also rearranged to strengthen your skin synthesis. What Are The Ingredients In Asap Super A+ Serum? Retinol (1.0%): Enhances skin repair, regeneration and renewal, particularly by speeding up the exfoliation of your skin’s damaged surface layer, allowing newer, more flawless skin to be revealed. Biomimetic Peptide: Facilitates faster collagen production and renewal-related mechanisms that noticeably enhances your skin’s health and overall complexion. 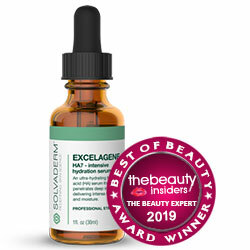 Tocopheryl Acetate: A Vitamin E derivative, it delivers a soothing sensation as it improves on your skin’s natural repair and rejuvenation process, and aids in rebuilding your skin’s protective barrier. 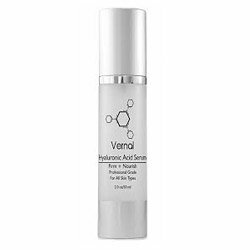 Hyaluronic Acid: Improves your skin’s hydration function by drawing in more moisture from the surroundings to bring your skin comfort from deriving improved skin conditioning and moisture. How to apply Asap Super A+ Serum? Asap Super A+ Serum is recommended for application on your skin, neck and chest as part of your evening skin care routine. Apply the product only on freshly cleansed and toned skin. 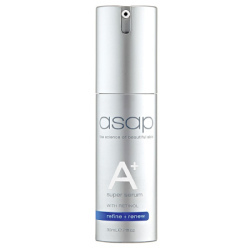 Asap Super A+ Serum is packaged in an opaque bottle which protects the product contents from becoming unnecessarily exposed to heat and sunlight, both of which can degrade or breakdown the contents of the formula. 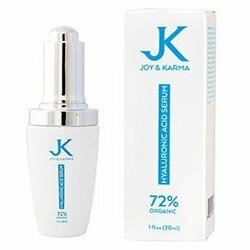 This product contains Vitamin A, guaranteed to drive both wrinkle correcting and skin lightening functions that promote the revelation of a more youthful looking skin. The manufacturer has guaranteed that this product is safe and suitable for use on all skin types. This product contains more preservatives than almost all of the ingredients in this formula, with phenoxyethanol, a neurotoxin, listed as the sixth ingredient in this formula. Asap Super A+ Serum reviews indicate that not all users may see visible anti-aging treatment results due to this product, and that could be due to the fact that different Vitamin A treatment concentrations are required for different phases of aging skin. 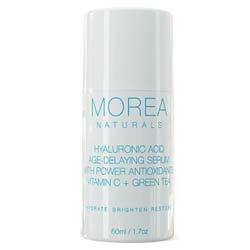 This product is relatively more expensive than most other common and widely available anti-aging serums. Does Asap Super A+ Serum Have Any Side Effects? Skin irritation and allergic reactions due to several ingredients, including butylene glycol and several botanical ingredients that can sensitize your skin, depending on your history of allergies. Increased photosensitivity which makes your skin more easily damaged by UV exposure due to retinol. Increased risk for nerve damage and brain associated dysfunctions due to phenoxyethanol. Increased risk for developing dysfunctions on organs belonging to the reproductive system due to EDTA. Asap Super A+ Serum contains the basic ingredients that you should be looking for in a serum, that is, when you need a decent solution that can function more for prevention rather than correction. However, when you need to factor in corrective functions to visibly correct and improve how your wrinkles, age spots, and other signs of aging to appear, you need a generally more concentrated solution.